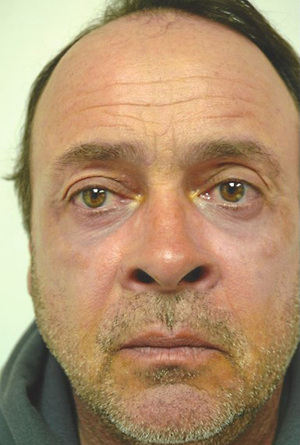 This 52-year-old man from the Bloomington area wanted to eliminate the bags under his eyes and the "crow's feet" that made his face look too severe. 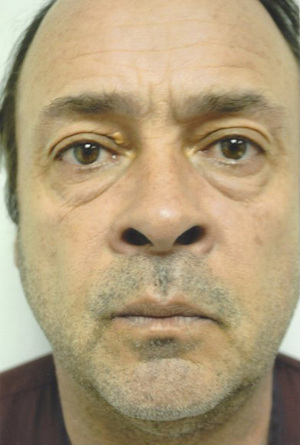 When he came to our Champaign-Urbana practice for an initial consultation, Dr. G.D. Castillo noted that he had excess fatty tissue in the lower eyelids, which he could correct with a combination procedure of laser skin resurfacing with a lower eyelid lift. Dr. Castillo performed the eyelid lift without external incisions, combined with Level III CO2 laser resurfacing of the lower eyelid skin, all while the patient was under general anesthesia. The patient was able to return to work in just 3 days with protective sunscreen. You can see the results of his eyelid lift and laser skin resurfacing in the before-and-after photos: no more bags, dramatically reduced wrinkles, and better skin texture. He is very happy with the more youthful, welcoming, and rested look Dr. Castillo was able to help him achieve.